You've fired up the grill and your steaks have been perfectly kissed by the flames. They're perfectly seared, at the perfect temperature, ready, plated with a baked potato and crunchy cool coleslaw. You reach for your steak knife. And then -- nothing. The knife just keeps messily tearing at the meat but not really cutting it. You need a higher quality steak knife. J.A. 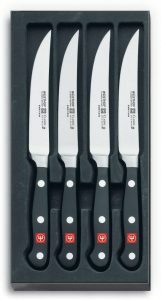 Henckels steak knives have a long and impressive reputation for quality at a great price. But there are a lot of steak knives out there. How do you know which one to pick? Which One Makes the Cut? 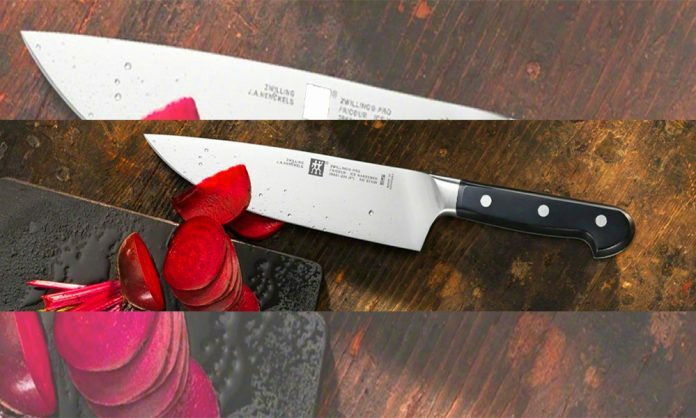 Zwilling J.A Henckels is a German brand with centuries-old innovation, expertise, and technology in creating exceptional knives. Their steak knives are sharp, beautifully designed and crafted to stay with you for the long haul. The beauty behind a J.A. Henckels steak knife lies in the fact that they have remained true to the basic construction and intended use of a steak knife. In addition, their products are reliable and affordable. But do you sacrifice anything for that affordability? And how do they stack up to the competition? Steak knives come with two edges: serrated and straight. This is always a matter of debate. Serrated knives require little maintenance and stay sharper for longer. Straight blades, on the other hand, have a clean cut and require less effort during the cutting motion, though they do dull faster. The choice is really up to you. However, there are certain common characteristics for all knives that you need to consider. Is it fickle to want beautiful steak knives? Not really. Steak knives grace your table just the same way fine china and crystal glasses do. Well designed steak knives add a great dimension to the table whether you are entertaining or eating as a family. Look for knives that are pleasing to look at and use to enhance your dining experience. A good steak knife should stay with you for a long time, generations even, despite constant use. It should be made from a highly durable material that can withstand sharpening, cutting through different types of foods and being handled regularly. Make sure the construction is solid by checking the weight of the knife. Do not settle for a flimsy knife but don't go for an overly heavy one either. It's easy for steak knives to easily become general utility knives in the home. They not only cut the steak, but they also cut through bread, vegetables, pizzas and perform other menial tasks like buttering toast. Invest in a steak knife that can not only take continual use but also does not retain the scent of the foods on the blade because of cheap material. 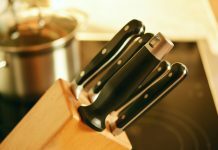 It is always best to have two sets of steak knives: the everyday utility steak knives and the high-quality steak knives for special occasions. Consider a steak knife that can easily be cleaned and maintained at home using a knife sharpener. This way they'll be sharp every time you need them. Hand washing is better than machine washing because the latter tends to destroy the blade’s edge and cause corrosion as well. The best steak knives come with a lifetime warranty. Most brands are happy to offer this because their knives come with strict instructions about care and handling that will help to prolong the knives' lives. Not following the instructions, which are as basic as keeping them out of the dishwasher, nullifies the warranty. Zwilling J.A. Henckels steak knives are much loved because they're well constructed using high-quality materials. They also feature aesthetically pleasing designs that make them statement pieces when laid out on the table. With J.A. 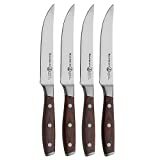 Henckels steak knives you can expect sharpness and Rockwell hardness of between 55 and 58. These two qualities ensure the blade is durable and sturdy and that it holds its edge well making it efficient for cutting. In the cases where the knife isn't forged from a single piece of steel, most handles have triple-riveting. The triple riveted handle is durable and offers great balance when slicing through even the toughest steak. Their handles also allow your hand to follow its natural grip during use. All J.A. Henckels steak knives come with a lifetime warranty. This ensures that you can replace them if defective and you are guaranteed a high-quality product. Zwilling J.A. Henckel International is a brand associated with excellent quality knives that remain affordable. Their steak knives are priced at between $30 to $200 depending on the construction, materials, and number of knives in the set. J.A. 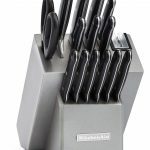 Henckels steak knives offer quality cutlery on the table at all times. Because of the great response to J.A. Henckels steak knives in general, we looked at what customers were saying about the steak knives we chose. You can rely on customer reviews to give you an honest opinion of the product away from the company line. We looked at the material used on the blade and handle to see how durable it was. The design and general aesthetics of the knives also came into play during our review because these are visible pieces on the table. Finally, we looked at the edge to predict how they would perform. J.A Henckels steak knives are lifetime investments that will benefit generations to come in your family. That is why it is important to buy the very best of their knives. Here are three top options for you that, with care, will last a long time. The blades on this knife set have an inverted serrated edge excellent for cutting as opposed to just tearing at the steak. They make an excellent gift idea because they come in a beautiful wooden box. The handles are also wood with natural looking grains and triple rivets. 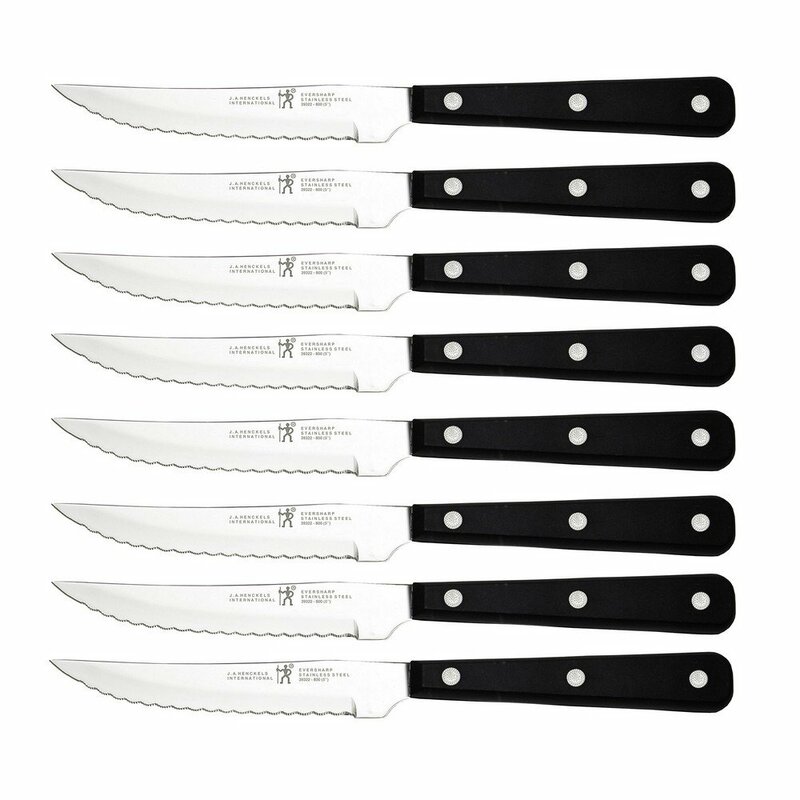 The knives come with tip protectors and the blades are full-tang making them strong and durable. They stay sharp and can stay that way for a long time with the right care. The storage case has a sliding cover and is fitted with small magnets that hold the knives in place. The blades are high carbon steel with a Rockwell hardness of 57. You can care for the wooden handles by oiling them using edible oils like coconut oil. The set has an average customer rating of 5 out of 5 stars on Amazon. You can also buy it through Bed, Bath and Beyond. 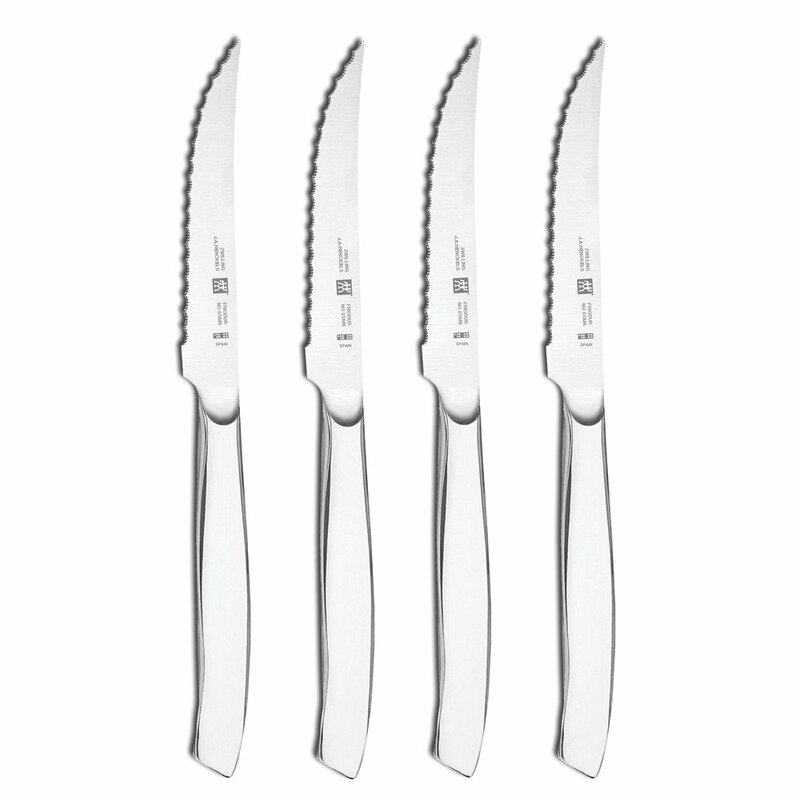 The four-piece set is perfectly balanced for quick, precise cuts around bones. These J.A Henckels steak knives comfortably fit in the hand. The blades are made from Stainless Steel and feature serrated edges. The handles are triple riveted to make them stronger and sturdy during handling. Their Rockwell hardness is 57 and they are full tang. 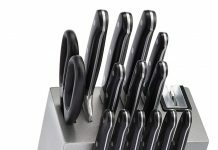 Here are J.A Henckels steak knives that are dishwasher friendly although the company still recommends that you hand wash them and dry them for longevity. Having said that, users who have washed them in the dishwasher report no corrosion or change in the sharpness of the edge. The edge has microserrations that help with precision. These are lightweight and somewhat dainty Henckels steak knives, but that's because of the balance on the knives as opposed to cheap materials. 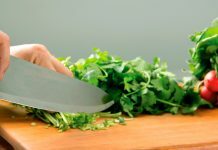 As far as versatility goes, they can cut through raw vegetables during kitchen prep work and, at the table, still cut through your steak like hot butter. They look great with the black riveted handles that create a beautiful contrast against the shiny polished blades. 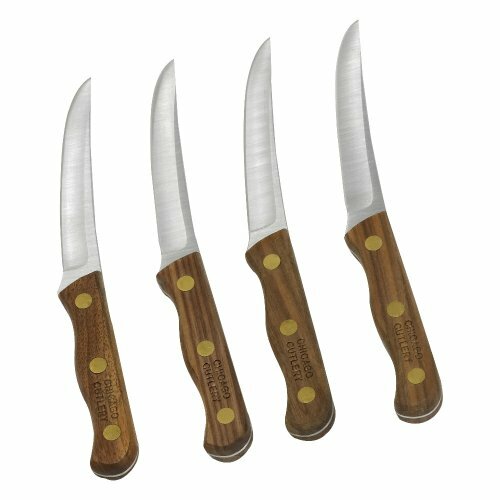 The knives have an average 4.0 out of 5 stars on Amazon where you can buy them. These Henckels steak knives have blades with serrated edges. The blades are high carbon stainless steel and taper into stainless steel handles. They're constructed from one piece of steel and come in a beautiful mahogany finished box with a deep auburn hue. The knives sharply tear at the meat instead of slicing the meat clean. They also clean up excellently leaving no stains and showing no corrosion. The handles are a little small especially if you're used to wooden ones. However, you will notice the handle also has a comfortable ergonomic design and the blade is angled which makes it easy to use. The knives are dishwasher friendly and have a nice polished finish that suits the dinner table. The average consumer rating of the knives is 4.2 out of 5 stars on Amazon where you can buy it. When it comes to choosing a great steak knife, just like any other product, you need to compare it to others so that you can really get a picture of it's usefulness to you. The construction of these steak knives is excellent. They have bolsters to give them balance and to keep them safe during use. The high carbon stainless steel blades are full tang and are embedded into the resin handle (Pakkawood is a wood and plastic composite). The combination of the stainless steel and the Pakkawood handle is extremely appealing. The edge is fine as opposed to serrated so the knives can get dull quite quickly. They are, however, super sharp when honed and the balance between the blade and the handle makes them easy to use. The handle has the traditional triple-riveting to keep it secure during use. The blade is five inches in length with an upward tilted curved tip. The blades are high quality German high carbon stainless steel that is rust resistant and holds the edge very well. Compared to the J.A Henckels steak knives their edge dulls quicker putting you at a disadvantage when using them. They are. however, aesthetically at par with the Zwilling J.A. 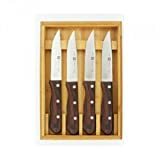 Henckels 4-Piece Stainless Steel Serrated Steak Knife Set because of the curved tip and beautiful handles although one is wood and the other resin. They have one over the J.A. Henckel options we reviewed because of the bolster that gives them perfect balance and keeps the fingers safe. This set has a customer rating of 4.6 out of 5 stars on Amazon. 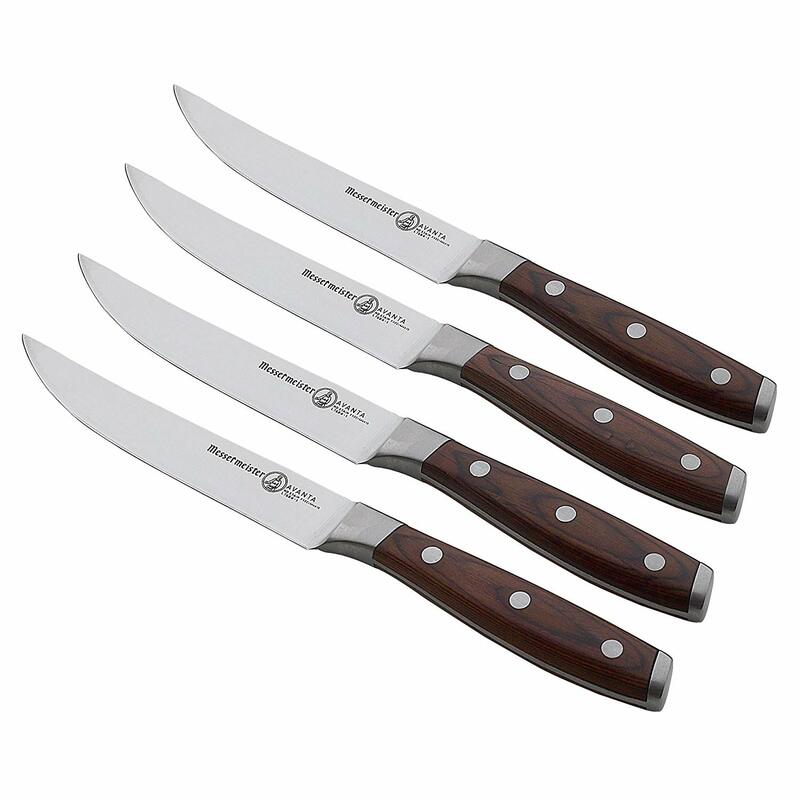 This four-piece set of steak knives is not only high quality but has marvelous aesthetics. The handles are triple riveted with a super comfortable grip. The knives are dishwasher safe with a lifetime guarantee. Their blades are high carbon stainless steel that has been honed by hand for extra sharpness. 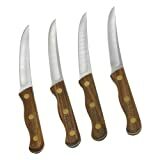 The knives feature a bolster which gives them excellent balance and durability. Their edges are straight so they need sharpening frequently to hold the edge. They're forged from one piece of steel and the blades are full tang. Their performance is only slightly superior compared to the J.A. 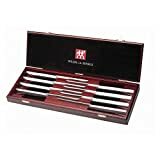 Henckels International 8-Pieces Steak Knife Set featured above. They have an average customer rating of 4.7 out of 5 stars on Amazon. 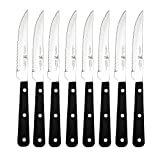 This steak knife set is Amazon’s choice for Chicago Cutlery steak knives. When it comes to the construction, the unique upward tilt of the front tip sets them apart. The full tang blades end in a triple riveted wooden handle with an excellent grip. Aesthetically, they're not the most appealing because of their somewhat bland design. The blades are high carbon stainless steel with straight edges so to keep sharp they need to be sharpened more frequently than any of our J.A. Henckels steak knives. 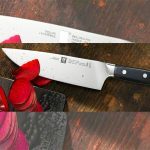 Even with the Taper Grind Edge technology which keeps the edge sharper for longer, the J.A Henckels knives have an edge (pun intended) over them. The handles are beautiful walnut wood infusing some character into an otherwise plain design. The dishwasher spoils the walnut handles so be sure to hand wash. They come with a lifetime warranty and have an average customer rating of 4.3 out of 5 stars on Amazon. Cutting a mouthful of your steak should be as pleasurable as preparing it. 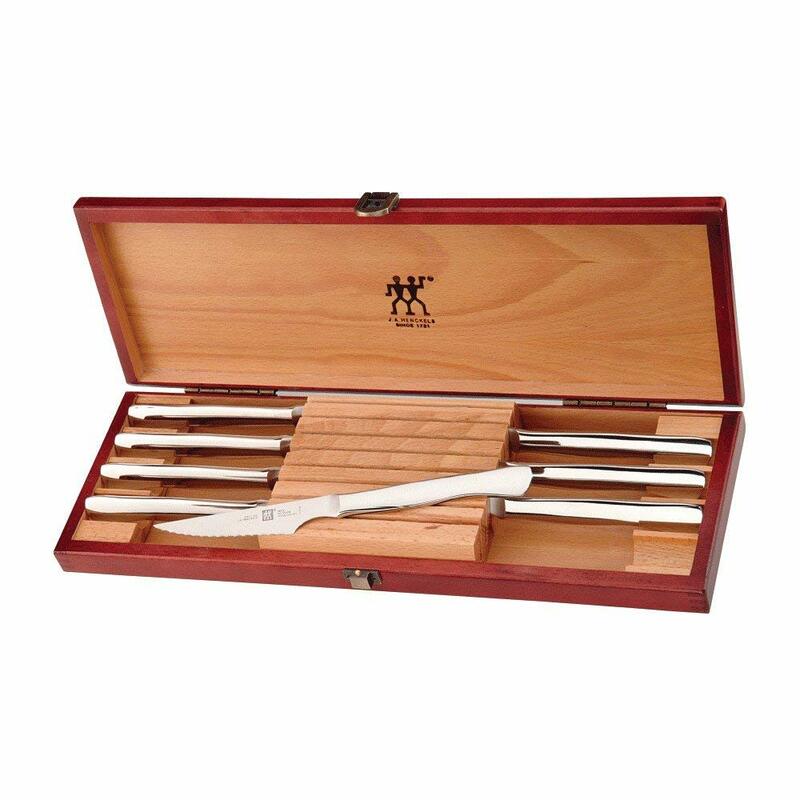 The J.A Henckels 8-Piece Stainless Steel Steak Knife Set in Wood Gift Box is guaranteed to give you that feeling every time. All our offerings are exceptional but this set has the aesthetics to grace a dinner table, the versatility to cut through anything and everything, and it treats your steak like a block of softened butter. With that said, these J.A. Henckels steak knives are smooth in performance, require little to no maintenance and absolutely no effort to cut your meat and they are dishwasher friendly. Do you have a favorite set of steak knives that didn't make our cut? Tell us about it in the comments!